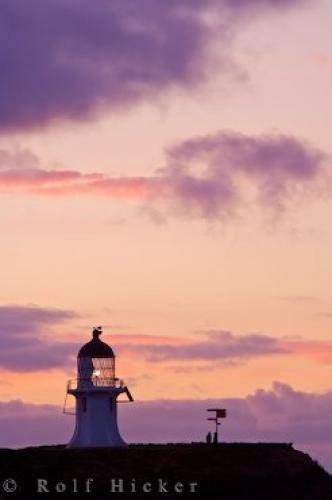 The sunset creates stunning colors in the sky at the Cape Reinga Lighthouse on the North Island of New Zealand. Sitting atop the hill at sunset near the Cape Reinga Lighthouse on the North Island of New Zealand, you can watch the sun disappear for the evening and change the sky into beautiful, soothing colors. It is a very romantic place to sit and watch the sunset with the sounds of the water crashing against the shores in the tranquility of New Zealand.As you enjoy the changing colors of the sky at sunset you would be amazed at how much time can pass as you relax and enjoy the spectacular scenery. Cape Reinga Lighthouse has stood in place since 1941 overlooking the meeting place of the Pacific Ocean and the Tasman Sea and each sunset seems to be prettier than the next.The Cape Reinga Lighthouse is now automated and helps guide ships around the tip of the North Island of New Zealand. Both Cape Reinga and the lighthouse are very popular places for tourists and it is a vision of beauty at sunset.Sunset at Cape Reinga and Cape Reinga Lighthouse, Northland, North Island, New Zealand.